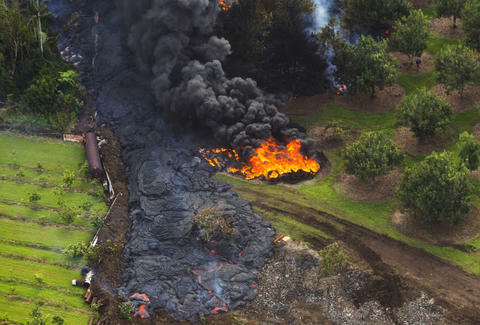 Following a series of more than 100 earthquakes in recent days, streams of lava are wreaking havoc in Hawaii. The Kilauea Volcano on the Big Island erupted this week, and it's currently spewing lava higher than utility poles, and forcing residents to evacuate as a "curtain of fire" burns through trees, homes, and roads. Eyewitness videos and photos are downright terrifying, and some look straight out of a disaster movie. Over 1,500 residents of the town of Leilana Estates were ordered to evacuate immediately, as officials aren't sure how long the eruption will last. Authorities are also warning of dangerously high levels of sulfur dioxide in the air. Since there have been so many earthquakes in the last week, officials are warning that things may only get worse. "Seismic activity is still extremely high, so we feel that this might just be the beginning of things," said Talmadge Mango, the civil defense administrator for Hawaii County, per a report from BBC News. Besides the terrifying scenes, witnesses have been subject to lots and lots of loud noise as the quakes rattle and the volcano continues to erupt. People have likened it to a jet engine, and "like someone playing the bass really heavy" according to the BBC News report. So far, no deaths or injuries have been reported, but the situation is incredibly dangerous and lava has destroyed peoples' properties. One resident of Leilani Estates told The Honolulu Star Advertiser that lava fountains were shooting up 150 feet into the air.